These small, low-cost satellites are an easy way for scientists to access space, but are lacking in one key area, on-board propulsion. 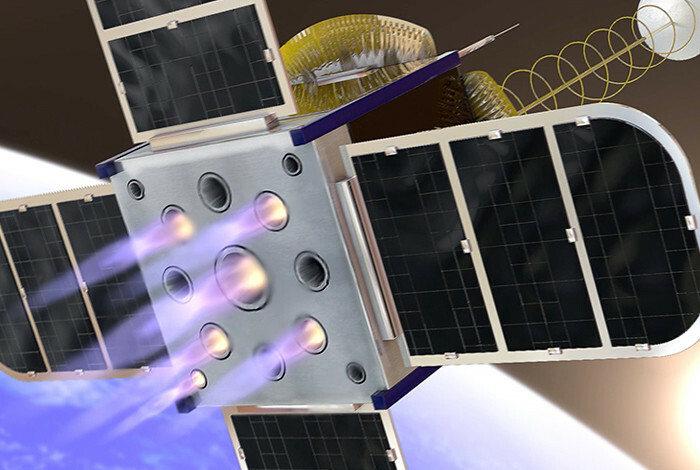 “I think we’re very close to being able to put this propulsion system onto a satellite for a simple demonstration of propulsion capability in space,” said Tappan. LOS ALAMOS, N.M., Oct. 13, 2016—Researchers at Los Alamos National Laboratory have developed a rocket motor concept that could pave the way for CubeSats zooming across space. These small, low-cost satellites are an easy way for scientists to access space, but are lacking in one key area, on-board propulsion. The technology is called a “segregated fuel oxidizer” system where the solid fuel and solid oxidizer are kept completely separate inside the rocket assembly. Mixed fuel and oxidizer systems are much more common and significantly more unstable. The rocket motor works in many of the same ways as a conventional chemical rocket motor. A pyrotechnic igniter provides the heat to initiate burn in a high-nitrogen, high-hydrogen fuel section, releasing gasses very rich in hydrogen. Those gasses flow into the oxidizer section and the chemical reaction there creates tremendous heat and expanding gasses that flow through a nozzle creating the bulk of the motor’s thrust. NASA currently tracks approximately half a million individual pieces of “space junk” in various orbits around Earth. Eventually small satellites will have to demonstrate a compelling mission before they can be launched, or have a de-orbit capability so they can burn up in the atmosphere and not add to the space junk problem.